Thirty two.... i can hardly believe it! I can also hardly believe that it's practically the end of July. Sigh. Where does the time go?? Last week i hurt my back. So i spent much of this week going to chiropractors and getting massaged. But not in anyway relaxing. My chiro literally had to jump on me! She told me to get myself to a massage therapist - who worked on my lower back/glutes and shoulders/neck for an HOUR and told me that of all the people she's seen, i'm the tightest. nice. It was painful, but in the end, my back is feeling much better. I managed to get out of the house quite a bit this week - thanks to my wonderful husband. I went for supper and had the most delicious margarita ever... last week i had the biggest half plate of nachos ever with another friend who was in town for a few days... i went with my Ladies Night Out group to a Succulent Pot Class (which was AWESOME!! Plants that thrive on neglect are my kind of plant!) I took Chewie to his very first movie in the big theatre to see Cars 2! which he loved, but the movie was 2 hours long and by the end, even Mater couldn't keep my three year old's attention, and we started Artoo on solids this week! This is a big deal! So happy he handled it well, and really enjoyed it. Every little milestone for him seems so monumental for us. B-rad has been busy with renos in the basement, it's really coming together! i can't wait - the basement will be our studio/den/no kids allowed area for music and art and general mom and dad down time!! oh, and I got a new Tattoo! Isn't she beautiful? i call her Clementine. 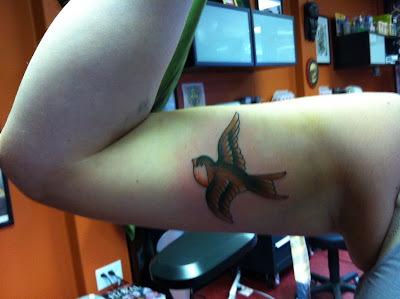 <3 I got it with my BFF who got a lovely flock of birds on her wrist at the same time. awww. I love that every week of the Diva challenge, we get to see each person’s unique and wonderful interpretation. It’s an stunning affirmation of the natural beauty that lives in all of us. I know, it’s kind of mushy, but it’s true. I was recently asked to participate as an “Artist of the Month” by a new local restaurant. Each month Amicis gives their wall space to a local artist. One section of the show will feature a wall of Zentangle tiles that have been created by different artists, using the same four tangles. The challenge: Use a 3-1/2 x 3-1/2 inch tile. If you have an official Zentangle tile, great, if not, that’s ok too. The frames I will be using fit this size tile. Use any string you like with these four tangles: Pais (by Mikee Huber), Zedbra (by Laura Harms and Margaret Bremner), Keenees (by Donna Hornsby), and Baton (by moi) to create a response to this challenge. If you are so inclined to participate in the actual show, please do them in black and white, send your tile to me, and I will hang it in the show. Realistically, I can’t send your tile back to you (as I am not very adept at clerical tasks) and I’m not sure what fun they will see after the show, but I know they will find their way to wherever they belong in the world. Send your tile (by August 10) to: Carole Ohl, 2520 Evelyn Drive, Dayton OH, 45409. Have fun and thank you! Thanks, Laura, for letting me loose on your challenge this week. May, 2010, and teaches this “art for everyone” in the Dayton Ohio area. I have missed doing the challenges! Finally had some time, so I jumped right on this one! It has been great to see the different individuals put up their challenge ideas. Thanks to all! Thanks, Carol, for a great challenge. Carole is one of the most dynamic tanglists that I know and I love her work. I wanted to resist the temptation to try and copy her style. Tough assignment when it comes out less beautiful but that is the way it goes. Thanks for the challenge! Thank you Carole for the challenge ~ I'm your biggest fan ~ just love your work ~ my humble attempt is in the mail ~ Aloha! Carole, thanks for the challenge. I've never used most of these tangles. Still undecided about sending it in...may do another one later this week. Glad to hear, Laura about Artoo on solid food, and take care of yourself and your back! Got mine done...don't think they're good enough for a show...but I enjoyed the challenge! Thanks! Geesh! I did it again...I don't understand why my link posts twice!! Sorry! Thanks Carole, I enjoy all four tangle choices! I hope my ZT reaches you in time as it takes 10 to 14 days to reach the US from Tassie! I've completed my tile. And for what its worth I have put it in the post. No guarantee it will make it from New Zealand on time. Fly little tile... fly. That was a great chance to try some tangles that I've admired but never tried. And a reminder to use Keenees again. Perfect summer tangle:) Also Carole, I love the context of your upcoming show. Thank you. Commiserations on the back problem. Chiropractor's are no fun and so expensive. (at least here in the U.K. they are). Glad you've been out and about though. The guest challenge was, as always, great fun and all new tangles to this learner too. I'm in agreement with the Diva: IT'S ALL GOOD!!!! 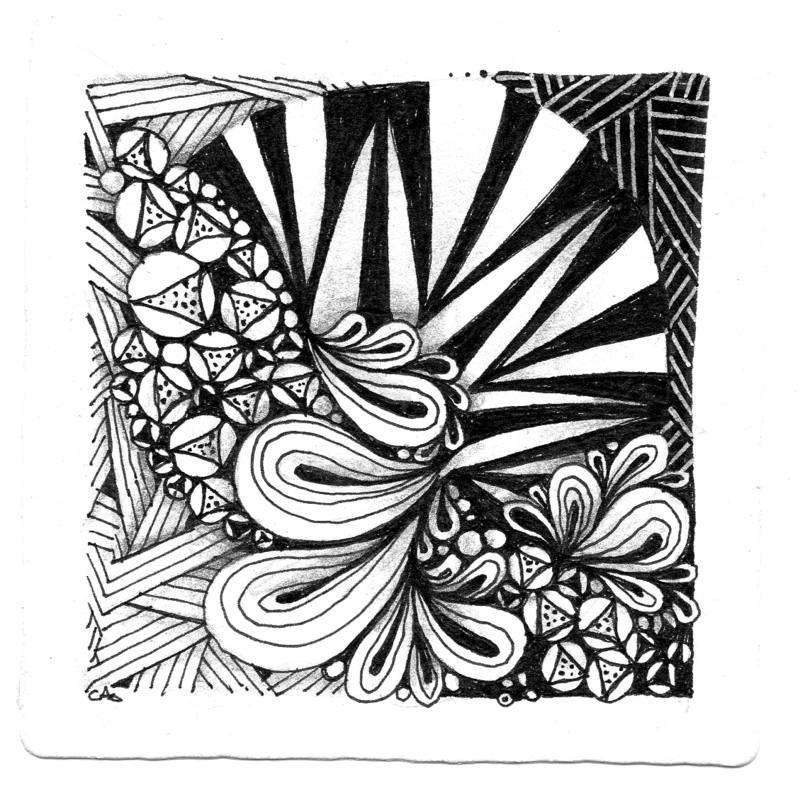 That is the beautiful thing about Zentangle! Showing them in the exhibit is like all of us being in one place at the same time, just like the slideshows. I'm excited and grateful for the opportunity to see/feel all those little pieces of paper with all your creative energy dancing on the walls with each other!! "It's not how it looks, it's how if feels!" I didn't expect to like this but once I got into it I was quite pleased. I'll be sending mine in to you Carole! And with any luck, I may be able to come see the show. Let us know when it's up! The show runs from September 5-October 1. You are all invited!!! Oh I liked this challenge! All four patterns were fun - I'll be incorporating them in future tangles - Thank you! Oh, this is my first time doing a Tangle Weekly Challenge and I loved it, but I linked to the wrong thing in the list and then got it right I think. I don't know how to delete the first incorrect link above, though. SORRY!!! As far as the challenge goes--it was great fun, I learned four new patterns, and it really was a challenge! Win, win, win!!! Thanks so much for the opportunity. I can wait to get home from work to start on this Challenge. Looks fun from looking at Linda's and Carol Ohl's challenge. 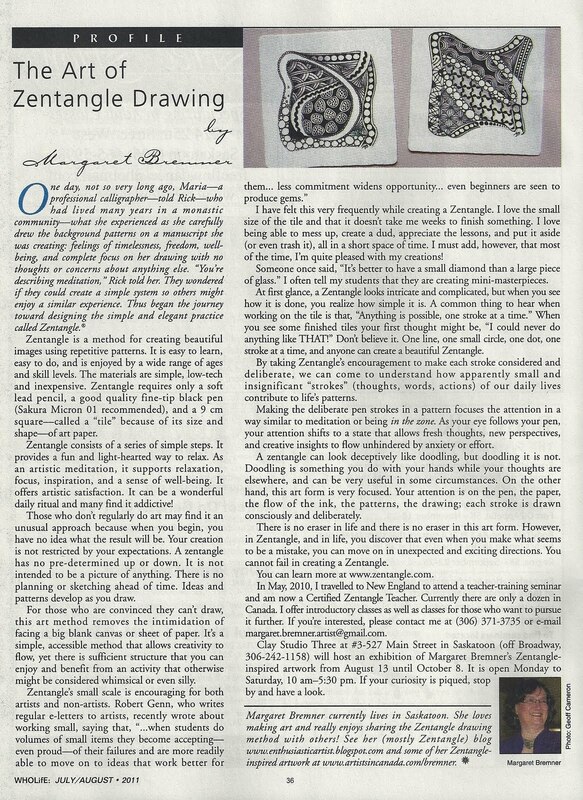 So sorry fellow "tanglettes", I just realized that I accidentally linked to my fairy post (#22) and not my "Zentangle is for Everyone" post. I redid it and my second entry (#35) has the correct link. Whoops! Laura, sorry you've been "down in your back," as we say in the mountains, and misssing out on holiday fun. Looks like you got in SOME Fun Stuff, anyway. Glad to hear Artoo's taking solids: maybe easier to swallow safely, and less risk of pneumonia? And Carole: Thanks for the great Challenge, and for making me Stretch!! Lots going on in your life. 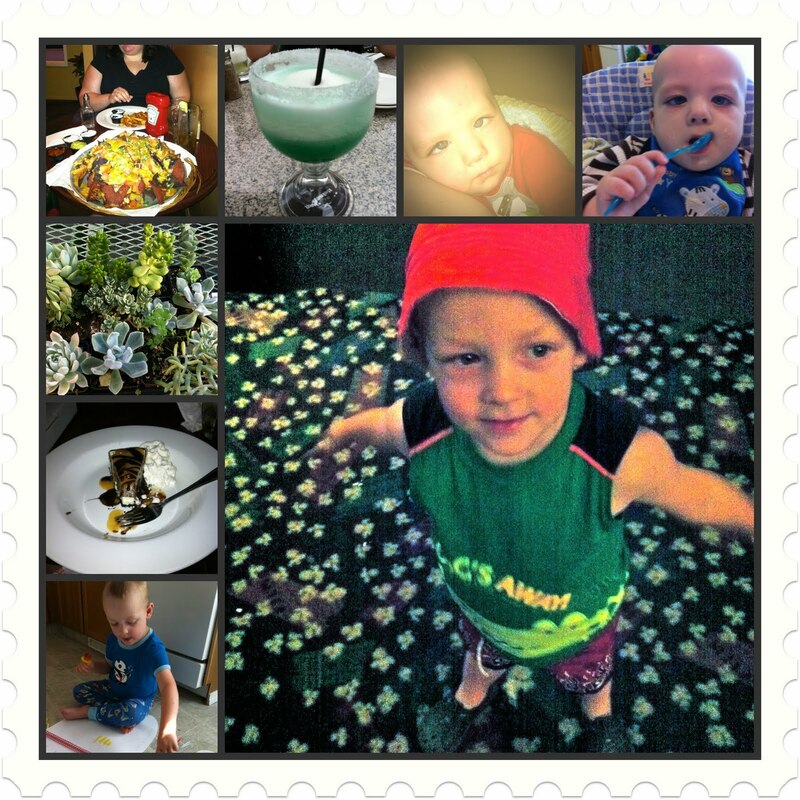 Laura..... Artoo and solid food is a major plus (bless his cute little self!! ), your back woes not so, but thanks as always for keeping the flame of tangling alive with this challenge and for inviting guest challengers to help you! OK, I did it and have 2 to choose from. Carole, if you want me to send you one, just comment on my blog and it will be on its way. Thanks to both of you for this challenge. I enjoyed trying tangles that I hadn't used before. Thank you Carole! I'll have my tile in the mail soon. I'm starting to get the tiles in the mail, so thanks, everyone. This is like Christmas! I've worked out a special way of framing the tiles, so am getting excited about the show. Thank you, thank you! Can't wait to see how many arrive and how they will party all together on the wall!! Thanks Carole for a great challenge and thank you Laura for hosting. The last few months I experienced a total ZT-block. It felt like I lost a very dear friend. This is my first ZT since April and I loved making it. Thank you so much! Since everything else in my life is running a day late why not the challenge too! Thanks Carole, for the interesting mix of tangles - always fun to see what develops. Good luck with the show. Well this is a good chance to get back into tangle mode. I have been lazy all summer. Thanks for the nudge.